As I begin to write this last blog for my last project as a design team member for The Rubber Cafe, I just wanted to take the time to say thank you to Melissa and Michele for giving me the wonderful opportunity of working with their amazing stamps and products. I have really enjoyed working for them and have grown so much as an artist while doing so, but need to take a break from being such a high producer for a little while. So, I bittersweetly offer up the last project of my term. 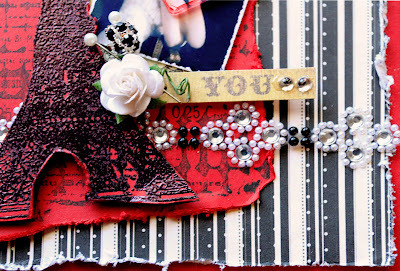 I created a really red hot, romantic card using some of those beautiful Rubber Cafe stamps and products. I started with some card stock, layered on a piece of the Webster's Pages Paper that I distressed. 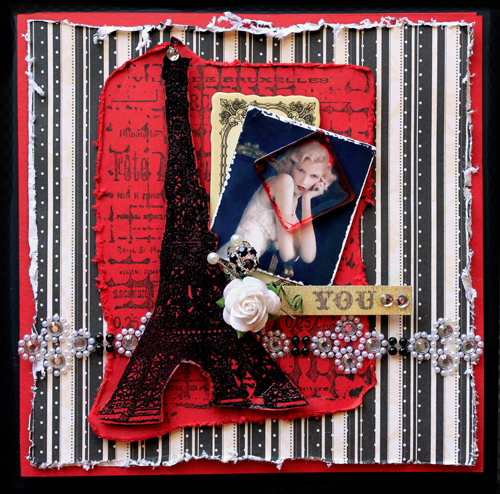 I then used The Rubber Cafe's Paris Nights Background Stamp and stamped onto another piece of card stock. I then stamped a second tower and embossed it with the Lindy's Embossing Powder, fussy cut it out, and then using some of The Rubber Cafe's One & Only Tape mounted onto foam, I attached the cut out to the stamped original for dimension. I accented the top of the tower with one of The Rubber Cafe's Crystal Clear Jellie Dots. I then layered on a piece of the Prima Chipboard, took a Vintage Image and distressed the edges, then took a Tim Holtz Acrylic Tile, alcohol inked the edges and placed it over the image for added drama. Next I added a Carta Bella "You" banner, accenting it with some more of The Rubber Cafe's Crystal Clear Jellie Dots. I popped on a little white mini rose and then added a bead to a pearl tipped stick pin and tucked it and one other pin into the rose. 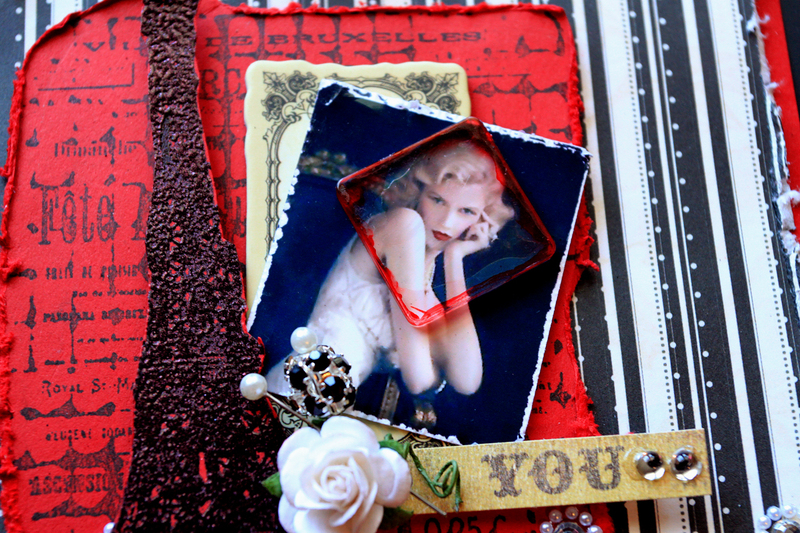 I added a piece of Webster's Pages Gems to finish out the elegant, romantic look of the card. It is my hope that you have enjoyed my projects as a Design Team member and that you have learned a few new techniques from me. I know that I have learned a lot from so many of the wonderfully talented women here! It has truly been my pleasure!! What a cool card! Love the distressed look and the vibrant colors! It has been fun checking out your projects. I love the use of this Paris background stamp. Beautiful!